← What turns women to Lesbianism? Ideas from 1966. 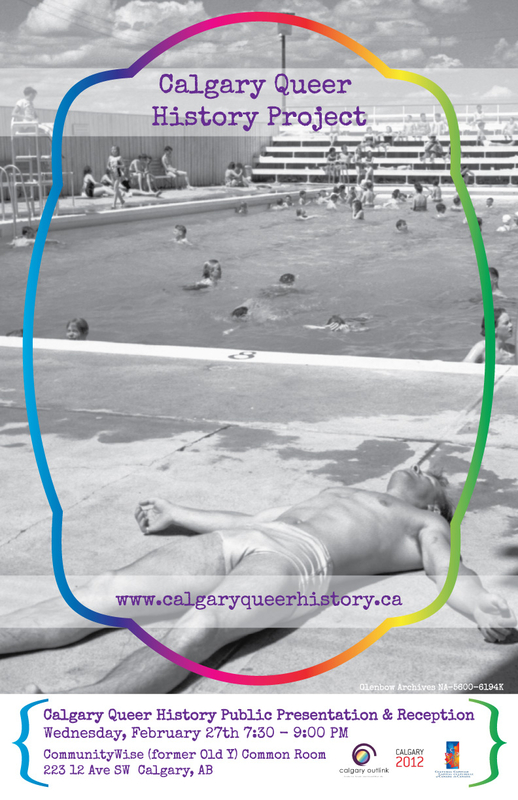 The time has come to wrap the first phase of the Calgary queer history project and make a presentation to the community about the findings to date. Calgary does have a secret gay history that we need to cherish and share! To that end, please join me for a public presentation and reception at CommunityWise (the Old Y), 223 12 Ave. SW from 7:30 – 9:00 PM next Wednesday. Special thanks go to Calgary Outlink, my historian in residency host, and Calgary 2012 who gave us start-up funding for this project. Also I need to thank Del Rath, who stepped up to be a volunteer scribe, chauffeur, researcher and cheerleader. Finally, thank you calgaryqueerhistory.ca readers! The website has had 3000 views to date, with lots of positive comments and feedback. This entry was posted in Gay history, Press Release and tagged gay, Gay history, lesbian, Old Y, queer. Bookmark the permalink.